It’s that time of year when I can walk out the door, planning to do the chores and find myself distracted by a multitude of tasks. Everything is turning green! We are still so very wet. Soppy, squishy, soaked. We need several days of sun in a row. Abigail smells the grass growing and is wondering when she can get out on the pasture. Having grown up on a grain farm …. I know that the farmers are feeling her pain. Multiplied times 10 or more. There is much to appreciate and enjoy! It really is not hard to find something to be grateful for, every day. When cuteness distracts, roll with it! Maybe don’t leave your chair, though. 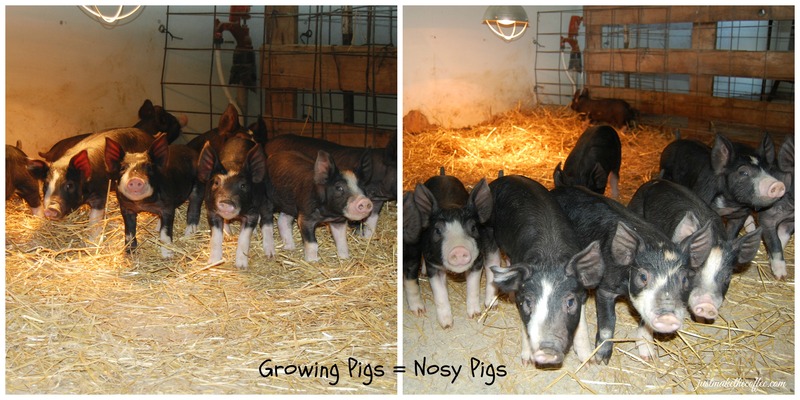 This entry was posted in Berkshire Pigs, Boer Goats, Country Living, Polled Herefords, Positive Thinking and tagged baby animals, Berkshire pigs, Boer goats, chores, Country life, goat kids, Polled Hereford cow, Shelbyville IL, spring. Bookmark the permalink. 20 Responses to Here’s to distractions! Love your clothesline header….reminds me of my childhood and early married life. Loved hanging clothes on the line! If I had those little kids around, I probably would never get any chores done! I had (might still have) family members in Shelbyville. It’s been years since I’ve heard from any of them. It would be wonderful to be able to find the farms they had, just to see the old home places. How interesting! and such a small world. 🙂 How long has it been since you’ve been to Shelbyville? I’ve never gotten to Shelbyville itself, I’ve gotten to Decatur and Arthur but wasn’t able to extend my trip. Hoping someday in the near future. A cousin is having a reception in a week or so and it’s also sort of a family reunion, unfortunately I can’t go. Oh well, one of these days. That magnolia (??) tree is spectacular! So glad you won’t be making a midnight raid on that magnolia. Such activities are sure to lead to the glamour slammer. Only after you got OUT of the glamour slammer. I don’t think they allow laptops in your cell. Thank you Julie! I mowed the grass for the first time today. Love the pictures of your “distractions”, especially the kids! We always had baby goats and calves growing up in Texas, but not so much anymore. I miss those surprises. Thanks for sharing yours! Thanks for reading and commenting! I’m glad my distractions brought you a smile or two. 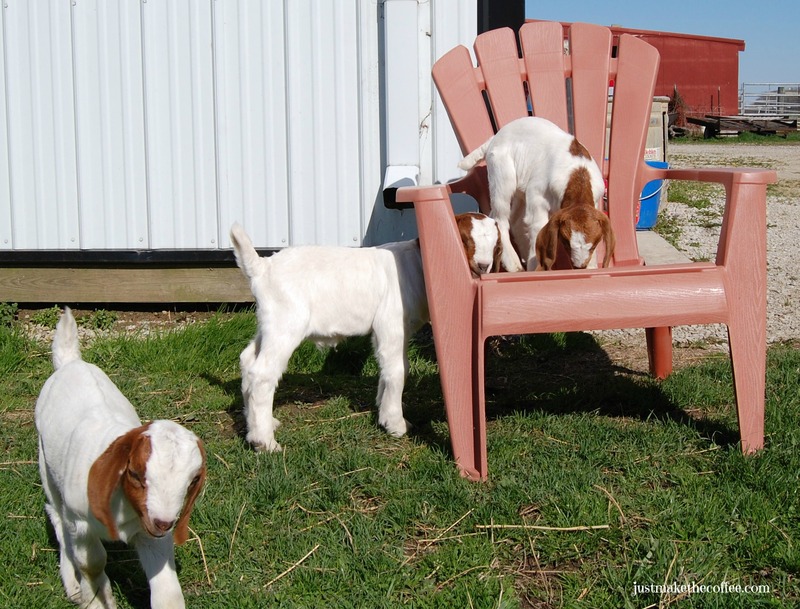 If you stay in the chair, you might find you have lap goats! They would definitely try it!